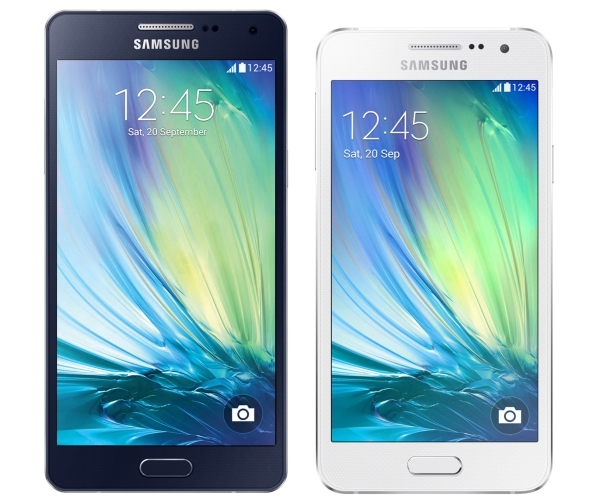 Samsung announced its Galaxy A-series smartphones Galaxy A3 and Galaxy A5. Both smartphones comes with full metal frame, slim design and a 5-megapixel front facing camera. The Galaxy A3 sports mid-range specification, whereas the Galaxy A5 packs relatively higher-end hardware. The Galaxy A3 and A5 are of 6.9mm and 6.7mm thin respectively. On specification front A3 sports 4.5-inch display with qHD (540×960) resolution, powered by quad-core 1.2GHz processor paired with 1GB RAM and 16GB internal memory which can be expandable upto 64GB through microSD card, and a 1900mAh battery. A3 has an 8-megapixel rear-camera with 1080p video recording capability, and a 5-megapixel front-facing camera. It runs on Android 4.4 KitKat. On the connectivity front, it supports 4G LTE / 3G, Wi-Fi 802.11 a/b/g/n, Bluetooth 4.0, and A-GPS/ GLONASS. Where as A5 has 5-inch AMOLED display with 720p resolution. The smartphone a 1.2GHz quad-core processor paired with 2GB of RAM. On the camera front, it has a 13-megapixel rear camera, and a 5-megapixel front camera. It comes with 16GB internal memory and a microSD card slot expandable upto 64GB. It has a 2300 mAh battery. On the connectivity front, it supports 4G LTE / 3G, Wi-Fi 802.11 a/b/g/n, Bluetooth 4.0, and A-GPS/ GLONASS. Both smartphones come with Ultra Power Saving Mode, as well as the latest camera app loaded with features including Wide Selfie, Palm Selfie, Rear Cam Selfie, and Beauty Face, which first came in Galaxy Note 4. The smartphones come in several color options, including pearl white, midnight black, platinum silver, light blue, soft pink, and champagne gold. Price details are not yet revealed, but the phones will launch in select markets including China starting November.